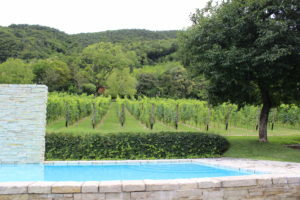 Swim among the vines that will someday be Nino Franco Prosecco. The vines of the Veneto region. 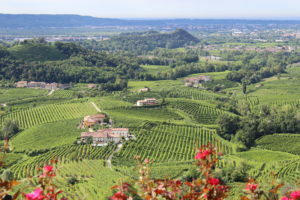 The “Prosecco region” of Italy is located in two provinces in northern Italy, the Veneto and Friuli Venezia Giulia. This region’s proximity to Venice makes it a very easy region for tourists to visit. You can be to the main city in the Veneto region, Valdobbiadene in less than one hour, which makes it possible to visit this area as a day trip, or if you would like to visit numerous wineries, you can spend a few days in this region. The Veneto is only a four hour drive from Milan. 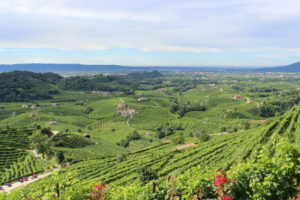 The Valpollicella region is half way between Milan and the Veneto region, so a stop half way between in Valpollicella, makes the drive from Milan to prosecco a very rewarding wine adventure! Valdobbiadene is the best town to be your base for visiting the majority of the wineries in this region. Driving the “Prosecco Road” makes a fabulous day trip. There are brown signs marking the “Prosecco Road” along the way, which makes this a very easy drive anyone, even the non Italian speaking novice travellers. 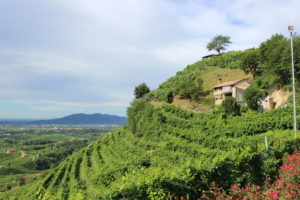 All along thewhich The best of the Glera grapes, which is the predominant grape used in the making of Prosecco, is grown on steep hillsides and harvested by hand. This makes for beautiful scenery. 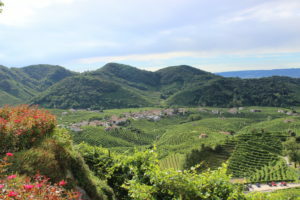 As I alway say, wine only grows in beautiful places, but honestly, the region outside of Valdobbiadene, Italy is one of the most beautiful wine growing regions in the world. 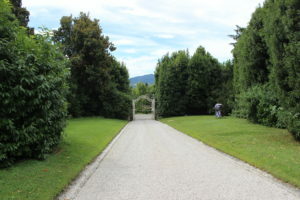 My recommendation for the perfect wine adventure to explore the prosecco region is to spend a few days staying at the beautiful estate Villa Barberina, while visiting PDC Cartizze, Bisol, Col del Lupo and Nino Franco Spumante, and then when you’re finished touring wineries in the Valdobbiadene area, drive thirty minutes down the prosecco road for some relaxation time drive at the beautiful and picturesque Duca di Dolle Relais for a day or two before returning to Venice. That to me sounds like the perfect prosecco experience. PDC Cartizze-PDC di Pietro De Conti Via Cartizze 5 31049 Valdobbiadene Treviso cartizzepdc.com info@cartizzepdc,com This is the must not miss winery to visit in the prosecco region! Matter of fact, this should be the first appointment that you have in this region. Pietro gives an excellent class that helps you to fully understand the production of prosecco. He gives you an excellent and educational tour of his vineyards containing some very old vines. His prosecco was the best I’ve ever tasted. Please email him for an appointment. Pietro ships wines to the United States. He was also helpful by shipping other wines that we purchased elsewhere and couldn’t find a way to ship it home. Pietro also makes excellent recommendations for local restaurants. We had a wonderful lunch at a place that he recommended that looked unimpressive from the outside, but had fabulous food, that we would have totally missed out on if it weren’t for his recommendation! It will help you to understand the region if like me, you don’t know much about before your arrival. Bisol-31040 S. Stefano di Valdobbiadene (Fol) Treviso www.bisol.it Bisol has a tour and a tasting available by appointment. This was an excellent tour. Bisol is the only winery in this area that I found that you are allowed to walk right on the production floor and watch their wine being produced. Unfortunately this winery does not ship wine to the United States. Interestingly, our guide, Daniela, asked us what hotel we were staying at, and when I told her “Duca di Dolle” she said that we received a free tasting, tour and 10 percent discount on anything we purchased. That was an unexpected surprise! If you visit Bisol, be sure and ask if the hotel you’re staying at is part of that agreement with the winery! Overall, a visit that was definitely worthwhile. Col Vetoraz-Strada della Treziese, 1 310049 S. Stefano di Valdobbiadene (Treviso) accoglienza@colvetoraz.it accoglienza@colvetoraz This winery offers only a tasting with no tour. The two young women working there knew little about their products and engaged in personal conversations for so long that I felt bad interrupting them to ask questions about their products. The tasting room does have a beautiful view and that is really the only reason to go there. This is a pass poured wine with a large production facility. This winery makes a cheap, low quality prosecco. Te view is beautiful and next to the parking lot is a great hike you can take and buy a picnic while on the hike. No appointment necessary. 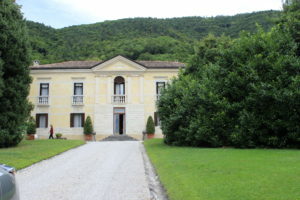 This winery produces one of the higher quality prosecco products from this region. This winery offers a tasting but no tour. You can see a small part of the operation through a window in the tasting room. What I enjoyed the most about this tasting was that I was surprised with a visit from Mr. Franco, himself! He couldn’t be nicer and more welcoming, by the way! I’ll never forget my meeting with him! Col del Lupo-Via Rovede, 37 31020 Vidor (TV) www.coldellupo.it I did not visit this winery myself, but this winery was recommended to me, and I plan to visit on my next trip to the prosecco region. 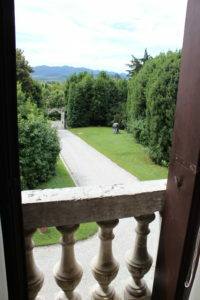 Villa Barberina-Villa Roma, 2 Valdobbedienne (TV). www.villabarberina.it info@villabarberina.it This is an amazing french style chateau hotel which is owned by the Nino Franco winery. Mrs. Annalisa Franco, Mr. Primo Franco’s wife, runs this beautiful hotel. I can not recommend this hotel enough. 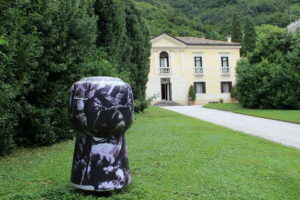 Villa Barbarina is an historic home that has been restored. The chateau is has furnishings from the family that originally lived in this home. It truly is an amazing place. You will feel like you are a guest of the home owner. The Franco’s have paid attention to every detail. All of the bathrooms have been updated to be comfortable, and yet very close to the period of the home. 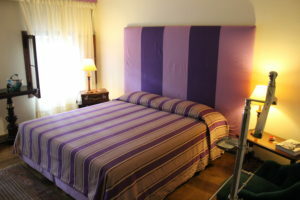 Villa Barberina only has five rooms, all with private baths. There is a modern pool which is simply stunning. This amazing estate is only a five minutes walk from the center of town. This is the perfect hotel from which to base your visit to the wineries of prosecco. Best of all, the prices are quite affordable. 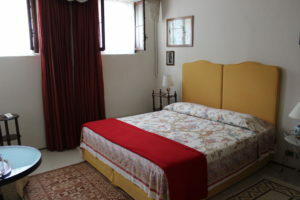 Duca di Dolle Relais-Via Piai Orientali, 5 31030 Rolle di Cison di Valmarino Treviso relais@ducadidolle.it This inn is about 25 minutes from Valdobbeidene, the main town and the heart of the prosecco region. The drive is far, but when you get there, you can enjoy perfection in a hotel. No T.V.’s no radio’s provided, because the proprietor Valdo, wants you to have a peaceful and relaxing experience. Cold plates of meat are available but no restaurant, due to the fact that he thinks a restaurant would interfere with the solitude of the inn. Breakfast is a buffet of all home cooked foods. Everything is raised and produced by this hotel. Literally, the eggs they serve are from their chickens, the meats are from their pigs. This hotel serves one of the most delicious breakfasts I’ve ever enjoyed while traveling throughout Europe. Breakfast does not start until 8:30, so plan accordingly to not make your appointments too early, and have to miss out on breakfast like I had to one of the days that I was there. There is a beautiful pool on the property. The view from the grounds of this hotel is breath taking. I highly recommend this hotel, despite the long drive from Valdobbiadene. It is totally worth it once you get there. The bathroom had a small shower with amazing jets, so even though the shower was small it was an enjoyable experience! I wish I would have allowed one day to just rest and relax at this lovely hotel, like the proprietor intends you to do while visiting this tranquil place. Ristorante B & B Da Andreeta-Ristorante B&B Da Andreetta Via Enotria 5 31030 – Rolle di Cison di Valmarino (TV) andreetta@andreetta.it This restaurant has an amazing outdoor view! This restaurant is in Rolle, about 25 mintutes from Valdobbeidene, and five minutes from the beautiful inn, Duca di Dolle. Very good food and excellent service. They serve fabulous meat plates, cheese plates, steaks and desserts. I ate here twice, which is something I almost never do on one vacation. Yes, it was that good! This restaurant is located very close to Duca Di Dolle Relais. Salis Ristorante Enoteca-Via Strada di Saccol 52 31049 – Valdobbiadene (TV) info@salisristorante.it This restaurant has a lovely terrace. The food including the zucchini flowers and fresh pasta dishes were incredible. We had a fabulous local wine. You must not miss this restaurant. Ristorante Alla Pergola-Via Rocat E Ferrari 29, 31049, Valdobbiadene, (TV) www.ristoranteallapergola.it info@ristoranreallapergola.it This restaurant was recommended to us by Pietro from PDC Catrizze, (which is also a must visit). This restaurant didn’t look like much from the outside, but the food was amazing!!!! You must go here. We were brought an amuse bouche that was a cheese soup that was amazing. I then had the gazpacho that was delicious. I then had the pasta made in Prosecco, and it was one of the best pasta dishes I’ve ever had in my life. You must visit this restaurant, but do make a reservation. It gets very crowded at meal times. Ristorante Pizzeria Solo Mattia-Localita Valle di San Daniele 1 Vicino Al Bosco Delle Penne Mozze, 31030 Cison Di Valmarino. Out in the middle of the woods in a beautiful park, is a pizza restaurant with a vast menu that serves perfect crispy crust Italian pizza. The staff was very friendly and they have an english menu. They only serve a cheap house cabernet, but it totally hit the spot for a super inexpensive casual dining experience. I had the pizza with buffalo mozzarella and it was scrumptious. My husband had something with a lot of meat on it and really loved it. 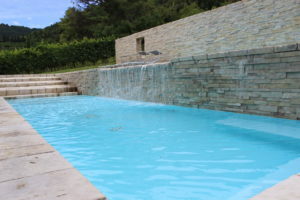 This restaurant is located approximately 30 minutes from Valdobbiediene, near the hotel Duca di Dolle Relais.